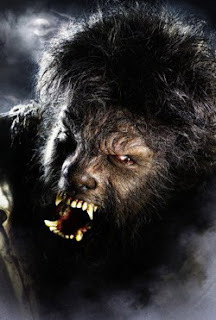 There's a lot of snarling, growling, snapping of teeth, ripping of flesh, dismemberment, beheading and very little bite in Joe Johnston's remount of The Wolfman (2010), or—as Rolling Stone's Peter Travers states it—"The Wolfman bites, but not—I think—in the way the filmmakers intended." The best part of my screening was the audience bah-rooing in protest during the film's closing credits. I got a kick out of that honest reaction. Twitch teammates Jim Tudor and Canfield have already weighed in with fine reviews—Jim detailing the production problems that led to the film's belated release and Canfield culling out what works and doesn't work for him in this miserably flawed vehicle—so there's not much for me to add other than a few minor concurrences. Jim considers The Wolfman as "maybe the best gothic horror film" he's seen in a while. "Maybe" is a careful qualifier and certainly apt in this technically proficient film that borrows the brooding bluish (if not overused) nocturnal palette now well-familiar to fans of Tim Burton. Jim credits screenwriter Andrew Kevin Walker for delivering "frequent werewolf group-carnage scenes" and—I have to admit—this does away with the somewhat silly trope of the Universal original where the Wolfman (Lon Chaney, Jr.) stalked victims through forests only to pounce on them and choke them to death. However, the remake's loud and thrashing scenes eschew nuance for startling audiences with amped sound and quick movement and—as proficient as set design, costuming and make-up lend to the film's purported atmosphere—contrary to Jim, I find it all easy to dismiss, admitting little interest in films that capsize narrative into atmosphere solely for atmosphere's sake. With multi-million misfires such as this I frequently consider what might have happened if all this money had been divvied up and parceled out among younger motivated filmmakers who could have possibly done more to deliver not only style, but maybe innovate some substance through sheer necessity of imagination? Canfield's critiques strike me as honest and fair, especially in his "sense of a film frustrated by it's own hyperactive tendency to leap forward on all fours when it should be slowing down to develop its characters." That's the quintessential critique, isn't it? The Wolfman lacks character when it had one of the best characters in all of cinema history to work with. It will stimulate as special effects always stimulate; but, I'm hard pressed to call it entertainment. The Wolfman will go the way of most contemporary special effect films. It's the kind of film I recommend you watch on On Demand or Netflix Instant Play when there's not much else to catch. As for the performances? The calibered reputations of Benecio del Toro, Anthony Hopkins, Emily Blunt and Hugo Weaving simply prove yet again how big-name actors become the mannequins on which a movie's look are dressed. As much as it breaks my heart to say so, del Toro's is a throwaway one-note performance of brow-furrowed agony. Hopkins plays his overly familiar villainous type (anymore the moment he enters a storyline, I suspect he's bad) and Weaving phrases his lines in a readily reconizable manner—"Mister Talbot"—all predictable with no surprises. And Geraldine Chaplin? Well, let's just say she's no Maria Ouspenskaya, lacking exactly—as Canfield has astutely observed—the moral and spiritual authority of Ouspenskaya's characterization. It's interesting to consider what lesser-known actors might have leant to these character types, which—played out by major actors—only emphasizes how much their skills have been tethered?